Seventy-one of the top male players in the state competed in the Florida State Closed Men’s 35s and 45s Championship at the Boca Pointe Country Club in Boca Raton Aug. 3-6. Nearly 100 spectators attended daily to watch the high quality of play. Andy Lake and Pablo Arraya reigned singles champions. Andy then teamed with Gerrit Disbergen to take the 35s doubles title, and the team of Whiney Kraft and Gregory Neuhart took the 45s doubles title. 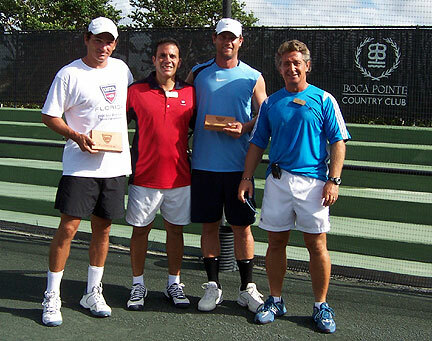 Boca Pointe Country Club is a full service country club with twenty-nine har-tru courts. Boca Pointe has an extensive social and competitive tennis program with a junior tennis academy, Palm Beach County Ladies, Grand Slam Men’s, Mixed Doubles, Senior, WTT and USTA teams. The junior program, USTA teams, clinics and private lessons are open to non-members. 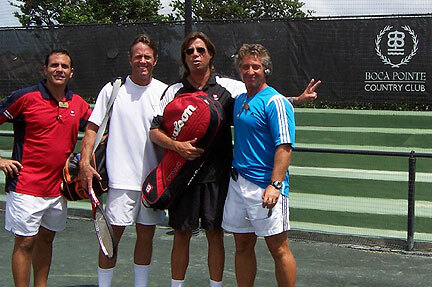 Boca Pointe is an official Cardio Tennis Site and Tennis Welcome Center. Boca Pointe Director of Tennis Angel Rodriquez served as Tournament Director.